On 22 December 1998, we received a delegation from the Sapporo Tourist Association which had been charged with finding a pipe organ for their new wedding chapel then under construction. Having cleaned the office and laid out little piles of information and gifts, we welcomed the delegation at about 11.00am and offered them coffee and biscuits. We then took them round the works and returned to the office to discuss their requirements over lunch. Starting from our brochure, a number of possibilities were discussed and assessed for suitability alongside the drawings of the building that they had brought with them. 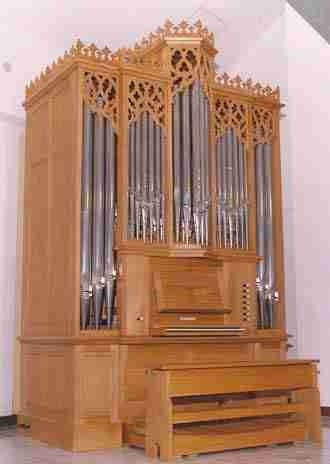 Two manual organs were too expensive, continuo organs were too small to play the Mendelssohn Wedding March. 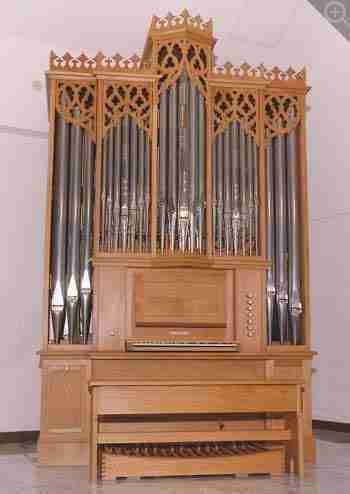 The best that was going to fit in the space was an organ similar to the one we built for Stavanger Cathedral a few years ago. That was settled as being the basis for their instrument and then came the surprise. The organ would not always be played by an organist and had to have the facility of playing itself. Up to that point we had been assuming a mechanical action organ, and the idea of a player mechanism was not one we had considered. 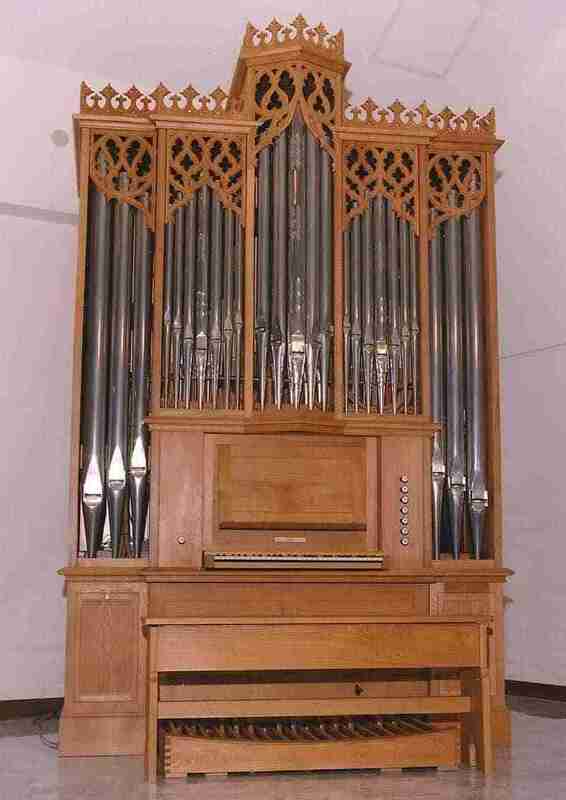 We were reluctant to revert to electric action, for a number of reasons, not least that of reliability and maintenance some few hundred miles away from any organ builder. But the idea of combining mechanical action and a player mechanism was a challenge which sounded worthwhile. After a little discussion, the president of the Sapporo Tourist Association stood up, shook hands and ordered the organ. Until relatively recently in Japan, some significant contracts running to millions of pounds would be agreed in this manner. Until then, our record for the time elapsed between submitting a proposal and receiving an order had been two days but this was less than two hours. Agreement having been reached, the party departed in their hired coach and went to look for a supplier of pews and other furnishings for the chapel. The contract was soon confirmed with a letter, and we had agreed the price and specification without really knowing how this would be done, but a telephone call to SSL at Brandon confirmed it could be done. Relief all round. That was the easy bit. It was agreed between Bethnal Green and Brandon that the key action would be mechanical with heavy duty pull-down magnets for the player mechanism, the drawstop action would be electric and the player mechanism would be using a MIDI system with the tunes on a computer floppy disk. Unfortunately, there was not much time between the projected completion and shipping dates. This, together with the likelihood that the assembled state of the instrument in the workshop might not be complete enough at any one time for considered performance, suggested that there could be difficulties in engaging an organist at a specific time to achieve a guaranteed result. Certainly it was felt necessary to deliver the instrument complete with recordings, for this was the very purpose for which it had been ordered. At Brandon, the challenge of polishing up a wide-ranging wedding repertoire in a relatively short time soon gave way to the more practical reality of searching the now universal library known as the Internet. E-mailed exchanges followed and some telephone calls heard to contain phrases that were a tribute to the ever developing medium that is the English Language ("la, la, la laaaa ... you must know that" and "what about ....dum, dah, dah, dum, dah?" being just a couple!). The desired compositions that would accompany the hopes and aspirations of a multitude of newly-weds were identified and accordingly acquired as MIDI files. For those not familiar with the term MIDI (Musical Instrument Digital Interface), it should explained that it is simply a method of communicating between musical instruments and other devices using groups of numbers to represent functions. Playing a key, drawing a stop or moving the swell pedal will all generate their own number groups. These can be transmitted at high speed to control another MIDI-capable instrument or recorded and reissued back to the original instrument to give a record and playback function, as in this case. Probably one of the best ways to imagine this is to consider the similarity of a Morse code phrase where each dot or dash is communicated 31,250 times per second! For all the benefits that MIDI can bring, one of the remaining areas of difficulty for the pipe organ has been the handling of registrations. In the fast-moving world of synthesisers and high-street instruments, standards have been established to deal with this. But the variety and diversity of the pipe organ had remained a challenge in this area (until earlier this year with the introduction of SSL's jointly developed 'Organ Assist' software). And so, having acquired all the right notes, the next challenge was manually to register each piece. This was achieved using some third-party MIDI software and required more groups of numbers. A virtual console was created duplicating the 'available' stops of the console, and the MIDI files were used to produce an on-screen score of the performance. The files were each individually registered using something known as 'Step Time Recording'. There are two main methods of recording using MIDI - Real Time and Step Time. As you might expect, Real Time is what you do when you record a live (real) performance. Step time recording is used to amend or process performances in a more methodical manner. In this way it was possible to remove any existing registration information and replace it with that suitable for this instrument. In theory, it should be a simple matter to insert stop changes at the required moment to effect a seamless change. Practice often proved very different, as the true performance of slider solenoids (for example) take on a new dimension within such a rigid environment! The day came when the equipment arrived and was plugged in, and the start was promising but the pieces only played for about five seconds before stopping. Something was amiss. This was the moment of realisation that the challenge of polishing up the wedding repertoire might have proved the shorter option. Unknown at the time was the fact that the chosen MIDI files had been digitised from scores. In other words, the musical notation had been scanned rather than performed and registered for instruments with a decaying voice characteristic. Thousands of notes would have to be changed. Files were e-mailed back and forth until the problem was resolved but still there remained glitches, mainly due to timing, and the day before the organ was due to be dismantled for shipping (by air!) a joint meeting was convened at Bethnal Green ready with the files and a computer. Pieces were played and replayed, making adjustments as required to registration, tempo and fine adjustments to the putting on and off of stops to simulate manual changes. The Queen of Sheba proved particularly difficult. There are two people who would not be too upset if they never heard it again (and probably a number of neighbours at Bethnal Green, too). By 8.00pm that evening it looked as if it was going to be a late night. At 10.00pm, fish and chips were ordered. By midnight the coffee was getting stronger, and by 2.00am the kettle did not get a chance to go cold. It was finally finished at 3.00am and, after a final coffee, everyone hit the road! SSL doesn't do things by halves. From the start, they had worked out that with the MIDI file they could avail themselves of many more fingers and feet than any organist might possess. Through this, the wide-ranging nature of the repertoire involved could be met from a different creative perspective than the traditional two hands and feet approach would allow! Pedal quinting, sub and super octave couplers on both the manual and the pedals and manual to pedal unison and octave coupling was all seen as fair game. At times it looked as if half the keys on the keyboard were down (they all move with the pallets when played through the player mechanism). The organ builders, of course, had not reckoned with a super-organist with six hands and four feet. The wind held up, but only just. On Sunday 5 December, the installing team arrived in Sapporo to be greeted by six inches of snow, having been treated to the most wonderful aerial view imaginable of the Northern Lights. Snow was cleared from the entrance to the wedding chapel, and unloading commenced. The chapel itself was not the carpeted room we had feared but finished in white marble and with an acoustic that one would have expected in a room twice the size. As the organ was delivered part-assembled, installation took little more than a day, and then tonal finishing commenced. The room was rewarding, and the bold voicing combined with SSL's six-handed/four-footed organist was amazing, to say the least, although not entirely artistic. The MIDI files satisfy a purpose. For couples who are not prepared to pay for a real organist and probably don't know the difference, it satisfies the requirements. On a busy day there may be as many as 10 to 15 weddings. It is called (in English) "White Wedding". The couple and guests turn up and go to dressing rooms to get changed for the occasion. The ceremony is performed (rarely employing a Christian priest or minister) and the newly wedded couple emerges to be seated in an open topped car (even if the temperature is minus 10 degrees; we saw it!). With cameras beeping and flashing (they don't whirr any more) the couple disappears down the road to a send-off second to none, returning about 10 minutes later to get changed again and drive off in a more conventional fashion. It has to be admitted that the digitised MIDI files make for a wooden performance. The only pieces which felt anywhere near right were the Widor Toccata and the Bach Fugue in D minor. The extent to which this medium is not a threat to real organists with only two hands and feet became evident when such an organist came and played some of the same music we had on disk. There was no comparison and it is doubtful if there ever would be. But it serves a purpose here. Whenever a competent organist is employed, he or she has an instrument with which much could be done. It was a fun project and, with the growing interest in wedding chapels, it may even be a growing market. More importantly, the use of MIDI in this instance demonstrates how the technology can be embraced as one which is subservient to the pipe organ rather than as a threat or challenge. Is it a threat to organists? It may well be in the short term but, if it excites interest in the pipe organ amongst people who otherwise may never hear one, that in the longer term might be good for both organ building and organists. Music provided in MIDI format on floppy disks: Wagner Bridal Chorus from Lohengrin; Pachelbel Canon in D; Bach Fugue in G Minor; Bach Jesu Joy of Mans' Desiring; Handel "Hornpipe" from the Water Music; Handel Entrance of the Queen of Sheba; Karg-Elert Choral Prelude on Nun Danket; Charpentier "Prelude" to the Te Deum; Purcell, trumpet tune; Mendelssohn Wedding March; Widor "Toccata" from the 5th Symphony. 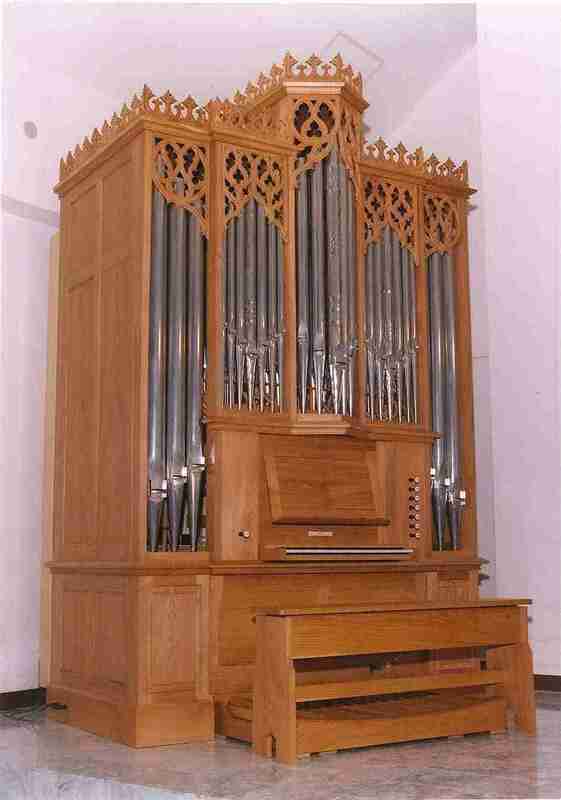 View the Specification of the Sapporo organ (completed 1999) and pipe scales.